My friend Barbara asked me for help with her son’s bar mitzvah. 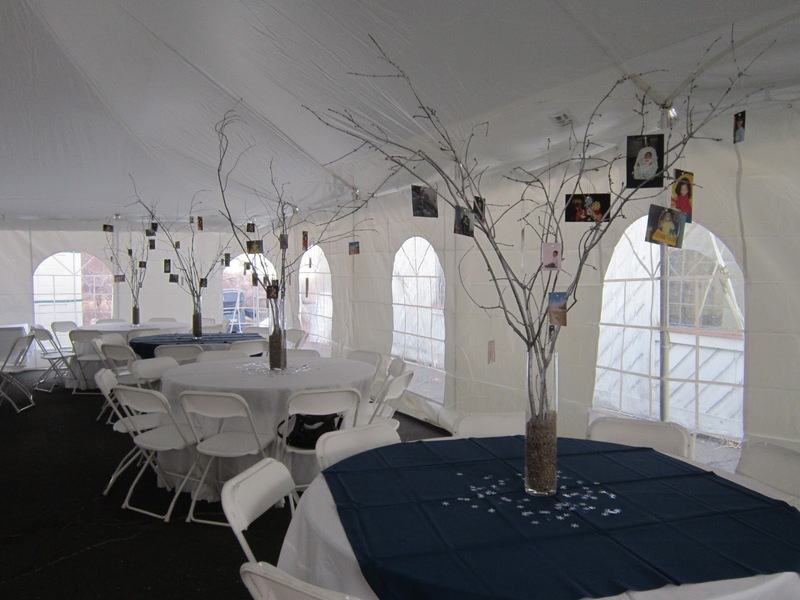 The Saturday morning Shabbat service was followed by a Kiddush lunch, held in a (heated) tent. 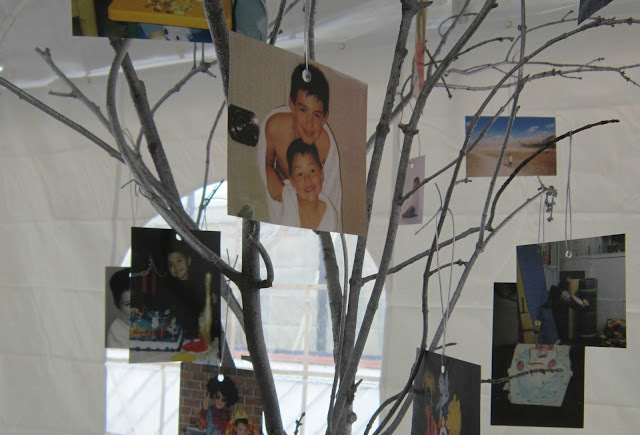 She asked for centerpieces incorporating photos of Josh—the bar mitzvah boy. She wanted to keep things “low key” and she didn’t want to spend a fortune. 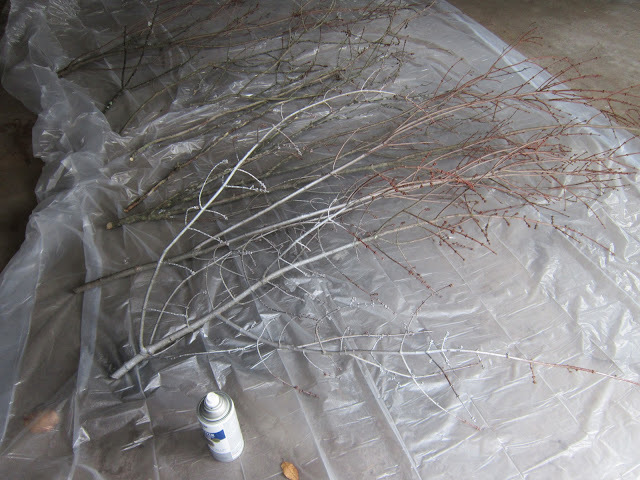 My first thought was tree branches. The tent had high ceilings so the branches would fill the overhead space nicely. 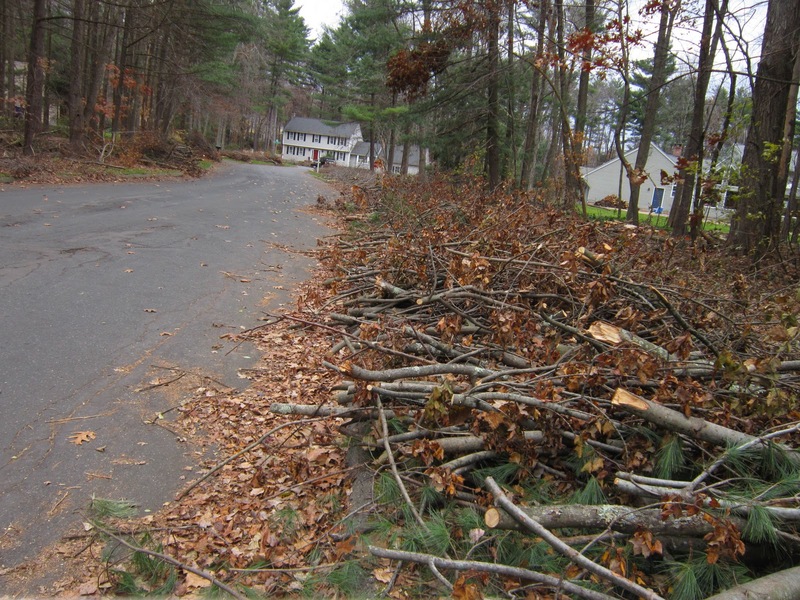 At the time, there was no way for us to know that Connecticut was about to be hit with Hurricane Irene and we would have all the tree branches we would ever want. Here is a shot looking down our street weeks after the storm—it was still a mess! After gathering lots of branches, I laid them down on a painter’s drop cloth and gave them a quick coat of silver metallic spray paint. 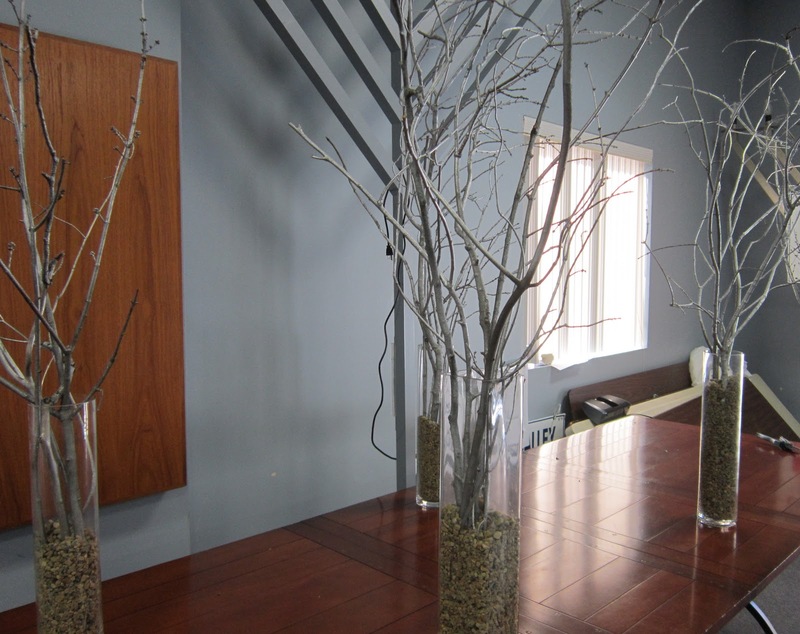 We ordered slim glass vases, 20 inches high. This way people would be able to see one another unhampered. 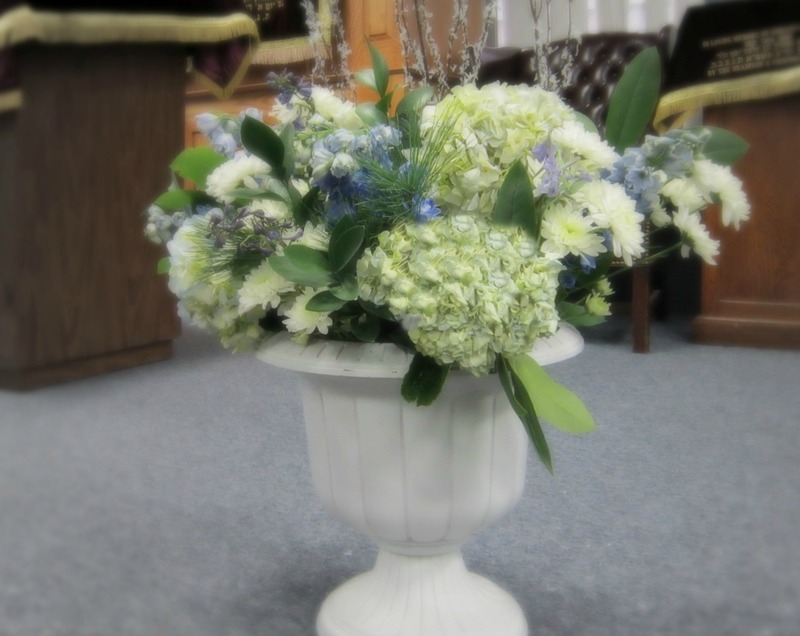 Each vase was filled with tiny stones to ensure they did not tip over. The next step was making colored copies of old photos of Josh. After these were spray mounted back to back, we cut them into rectangles with a paper cutter, punched a hole in the top, and tied them with some silver cording. The pictures provided a fun conversational piece at the party. Because Jewish law prohibits taking photographs on the Shabbat, these pictures were shot on Friday afternoon after we set up and not the actual Bar Mitzvah. Barbara also asked me to do the flowers on the synagogue’s Bimah. The average florist usually charges at least $100 for each large arrangement, but I picked up all the flowers at Trader Joe’s for under $40. 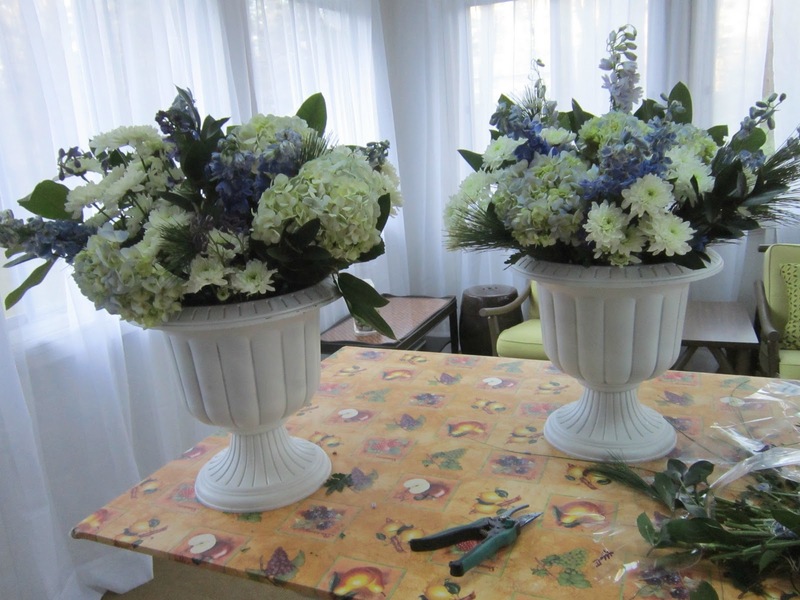 Both urns were filled with wet floral oasis which made for easy flower arranging. The bar mitzvah was a success. Mom was thrilled with the decor and the great job her son did!